A movie is a sequence of scenes. A scene is a narrative of its own. What are the best creepy movie scenes? 1. The Holocaust flashback scene in Shutter Island: The minute Leo and Mark Ruffalo walk into Sir Ben Kingsley’s office I get the chills. It’s the lighting, the blood red tones, the dark wood, the tense dialogue. Mahler is playing. It’s brilliantly perfect for this scene. The gory flashbacks help, too. 2. The human torso in “Freaks” – if you’ve never seen the movie, “Freaks” you need to drop everything you’re doing and watch it. It’s from 1932. They used real carnival sideshow acts as actors. One of the actors was “the human torso”. In this particular scene, the human torso is under a boxcar, crawling through mud, and wielding a knife between his teeth. His goal is to kill. He’s probably under your bed. 3. Willy Wonka and the Chocolate Factory Boat Ride: Full disclosure: I don’t like bugs. The crazy, LSD fueled boat scene in Willy Wonka & the Chocolate Factory still gives me nightmares. Shouting insane poetry, centipedes, chickens being decapitated. It’s a kids movie, right? 3. “The Thing” – Wilford Brimley gets it. I happen to think John Carpenter’s “The Thing” is one of the greatest horror movies of all time. I believe with all my heart that CGI was the worst thing for horror. Animatronics is where it’s at. And “The Thing” (along with An American Werewolf in London) does it the best. 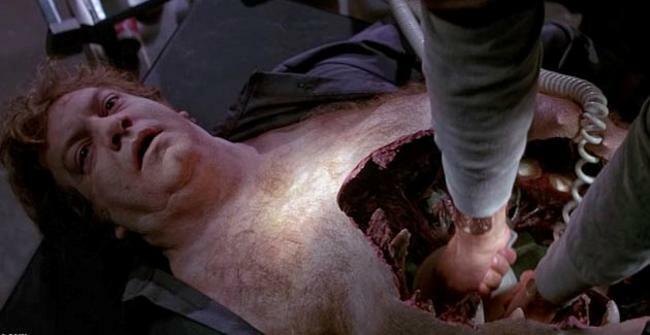 In this scene, Wilford Brimley’s character, Dr. Blair, has to use a chest defibrillator. Horror ensues. Diabeetus can’t be worse than this, right? 4. Seven – He ain’t dead. Seven is awesome for many reasons. One of my favorite things about it is the opening scene that incorporates a remix of Nine Inch Nail’s “Closer” but the scariest scene is in the “sloth” section of the film. Enjoy. I’ll add more when I’m not consumed with wine and hookah. 5. Three Extremes – What’s the secret ingredient? – Okay, everyone in Asia, I get it. Y’all are seriously the masters of modern horror. I remember watching “Three Extremes” for the first time in the basement of my Ballston townhome (God, I hated my roommate Tim but that’s a different story.) This movie is insane. It’s three short stories. “Dumplings” – one of the three stories – was actually made into a full-length feature that I plan on watching this year. Anyway, I felt so genuinely disturbed by this short that I wonder if the full fledged version will do the same for me. Basically, a woman consults a very unusual “holistic healer” for the secret to the fountain of youth. In this scene, the woman and the “healer” discuss the health benefits of dumplings. But what’s the secret ingredient?